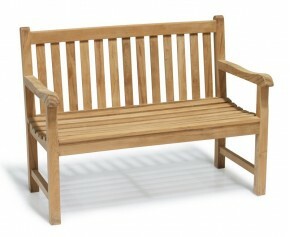 These classic teak memorial benches offer a touching way to remember your loved ones, or a special place or event. What better way to commemorate the lives of those closest to us than with a commemorative bench? 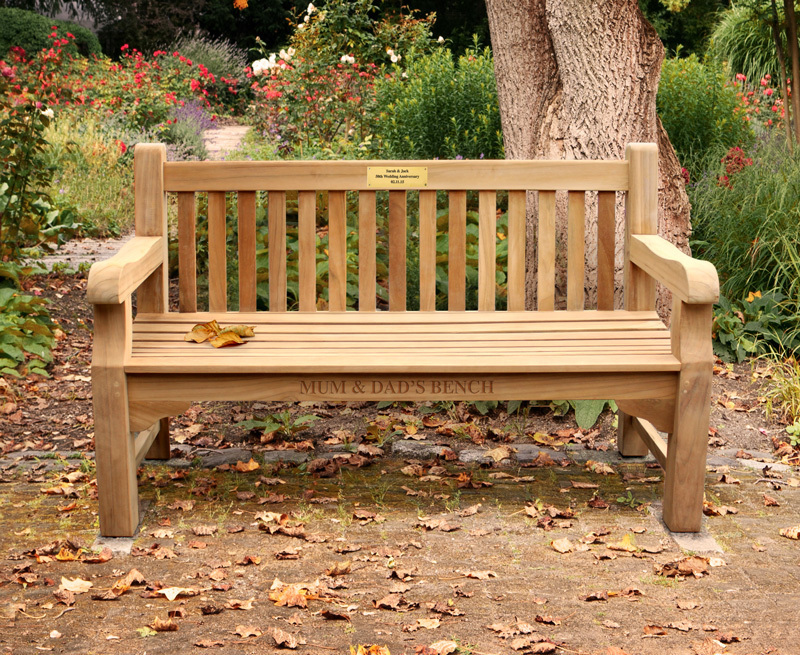 Choose either an engraved bench carving or have a brass memorial plaque fitted to the bench with a message of your choice, ensuring that these remembrance benches are highly personal and unique to you. Whether you are looking to commemorate a lost loved one with a sympathy garden bench or celebrate a milestone such as retirement or anniversary – a commemorative bench is a wonderful way to express your sentiments. Available with either an engraved plaque or a hand-carved inscription, our personalised memorial benches offer a lifetime of remembrance and a stunning place to sit and reflect. A memorial bench, or remembrance bench, will make a touching gift for someone special or provide a lasting tribute in a public space. 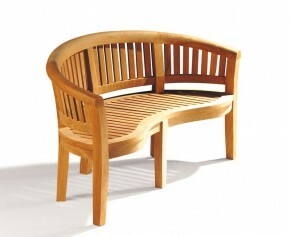 We handcraft our commemorative garden benches from the finest, sustainable teak wood. Built to last, our robust teak furniture can remain outdoors all year round. 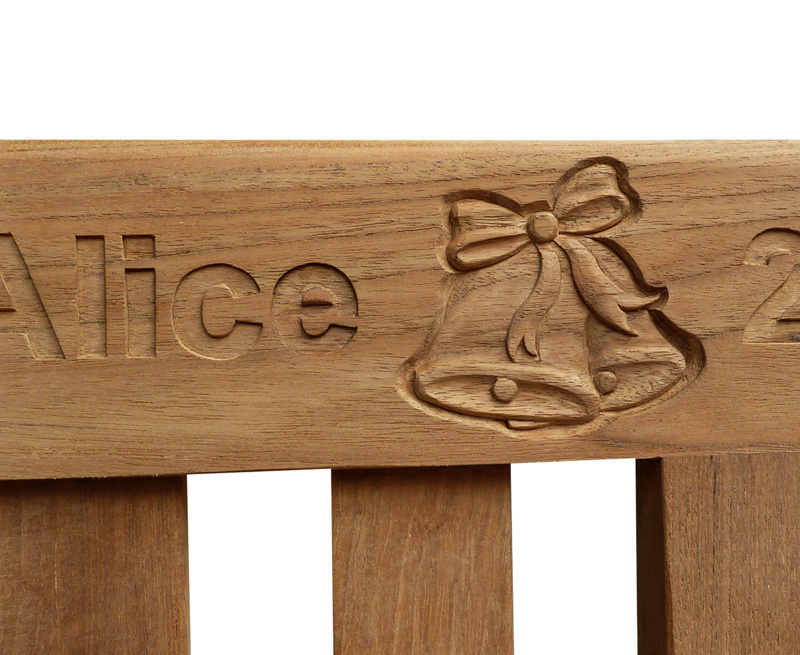 An engraved plaque is the traditional way to personalise your teak garden bench. They’re perfect for longer messages with more detail and come in a number of sizes to complement the length of your remembrance bench and the amount of wording. Our plaques feature chamfered edges for style and countersunk screws to ensure your comfort when you sit back on your commemorative bench. Every message is different so we offer a variety of fonts to suit the sentiment – we have the playful Informal font for a sweet message, the calligraphic Script to add sophistication to a classic quote, the clear and simple Modern ideal for dates and the traditional Roman to add a respectful touch to a tribute. Adding an image to your plaque is a wonderful finishing touch. We have a selection of symbols that we can engrave on request, and can even use different coloured inks to enhance your design – red ink on a rose or heart will create a stunning finish. We can also engrave custom business logos, get in touch to find out more. Do you have any memorial place wording example ? It can be a hard task trying to find the right words to commemorate a loved one so we can offer help and share examples of plaques we have engraved to ensure you get the end result you desire. A stunning way to display short memorial quotes, our carved inscriptions are lovingly made by hand rather than by machine. Our hand carvings are offered in two clear and intelligible fonts; Roman for a traditional and sophisticated serif style and Modern for a clean sans serif style. The most popular choice is the top rail, pride of place and easily spotted. On the top rail you can opt for 1 or 2 lines of text so this is ideal if you want to add dates below a name. We can also carve 1 line of text into the lower rail (under your knees), a quote would look lovely in this position. We can carve other parts of the bench on request - some past examples include a quote on the back of the top rail and a logo on the arm post. We want you to get the bench of your dreams, so if there is something else we can do to customise our teak garden benches to suit your requirements then let us know and we can see what we can do! If you would like to discuss any of these personalisation options in further detail then please give our friendly sales team a call on 020 8655 6242, they are on hand to help with any advice you may need to create your perfect remembrance bench. 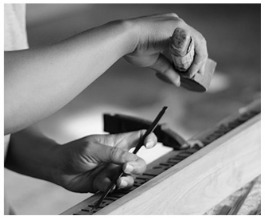 Enhance your wording by adding your company logo or a charming symbol that can be hand-carved into the teak by our master carvers. 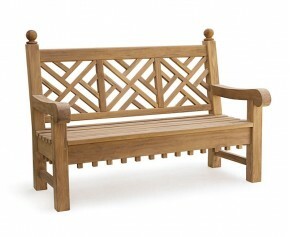 Offering a little more design than other outdoor benches, this teak lattice garden bench makes for a decorative focal point that looks stunning in any outdoor space. 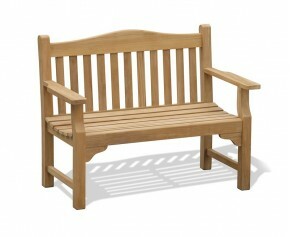 This teak 2 seater garden bench is stylishly simple and offers ample seating in smaller gardens. Featuring an oval back and cupped slatted seats for added comfort, this Ascot small garden seat adds a contemporary edge to any outdoor setting and works well to modernise existing garden furniture. 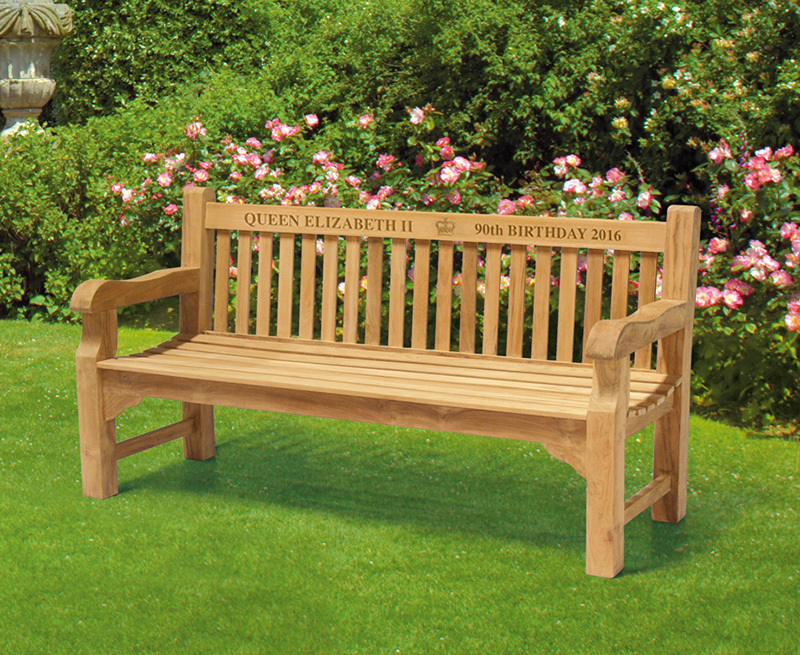 Combining the benefits of practicality and style, this expertly crafted Tribute 4ft teak commemorative memorial bench seat otherwise known as a remembrance bench, is a classic park/garden bench with an added design element of a deeper top rail to accommodate memorial plaques or carved inscriptions. 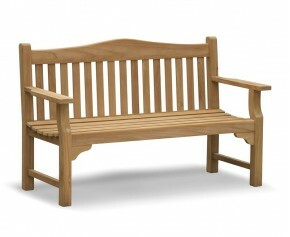 A beautifully designed public remembrance bench with an added feature of a deeper top rail to accommodate carved inscriptions and memorial plaques, this Tribute 5ft teak commemorative memorial bench seat combines the benefits of practicality and style and would look graceful in any outdoor setting. 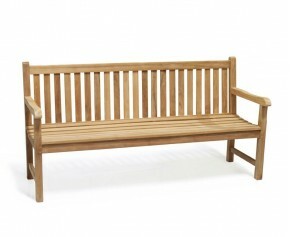 Featuring a stylish high back with wide flat armrests that are ideal for setting your beverages and snacks on, this 6ft teak commemorative memorial bench seat otherwise known as a remembrance bench combines the benefits of comfort and style and would look attractive in any discerning home or public setting. 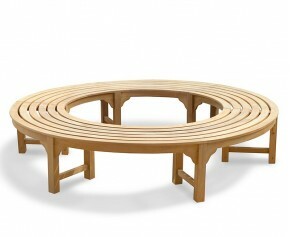 Sit back and relax in the shade with this beautifully constructed teak circular tree bench. Offering a comfortable and visually pleasing seating area, this circular tree bench incorporates the graceful elegance of the tree into the landscape of your outdoor setting and is sure to leave a lasting impression. 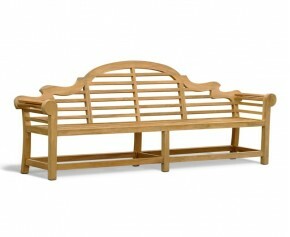 Featuring a stylish sweeping curve with a raked back for added comfort, this curved garden wooden bench is a unique item of garden furniture and provides the perfect focal point for gardens and architectural landscape settings. This classic, stylish and simple Windsor teak 4ft garden bench is a modest size and creates a comfortable seating solution in smaller spaces. 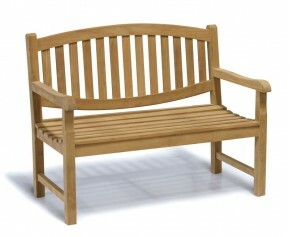 Featuring a smooth fine sanded finish, this small outdoor bench has been manufactured in the traditional manner with mortise and tenon joints and is delivered fully assembled for your immediate enjoyment. Combining the benefits of practicality and style, this stylish Clivedon teak 2 seater garden bench provides an attractive focal point that adds focus to any landscape and works well to blend in with existing garden furniture. This chunky Balmoral 4ft teak park bench is ideal in smaller outdoor areas and provides an effortless seating solution without taking up too much room. 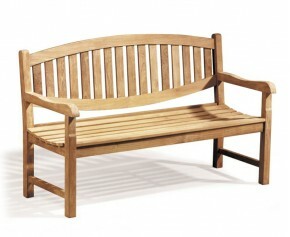 Manufactured in genuine A-grade teak, this classically stylish park - street bench has been built to last and will offer you trouble-free fruitful use for years to come. This classically stylish, chunky Taverners 2 seater garden bench combines the benefits of style and functionality and would look stunning in any outdoor setting. Manufactured in the traditional manner with mortise and tenon joints, this heavy duty garden bench features a stylish high back with wide flat arm rests. This teak lattice garden bench has a little more design to it than other outdoor benches, making it a great decorative focal point for any outdoor space. Hand crafted in the traditional manner using tight fitting, glued mortise and tenon joints which are secured with teak dowels, this timeless heavy duty 5ft teak park bench - street bench is equally suitable for both commercial and domestic use and features a stylish high back with cupped seats for added comfort. Offering ample seating for your guests during summer parties, this stylish Windsor teak 5ft garden bench adds to the scenery of your garden and works well to modernise existing garden furniture. This expertly crafted Chiswick 5ft Chippendale bench otherwise known as a Chinoiserie Bench offers a little more design than standard benches and features an intricately designed back rest which would look stunning in any outdoor setting. Manufactured in the traditional manner with mortise and tenon joints, this great value teak 6ft garden bench provides a long lasting piece of furniture which can be left outdoors all year round with minimal maintenance, making this wooden garden bench perfect for both home and civic use. Featuring a stylish top rail and a raked back for your added enjoyment, this banana garden bench offers the ultimate in style and comfort and would look stunning in any outdoor setting. Robustly constructed in the traditional manner of tight fitting, glued mortise and tenon joints in sustainable Grade-A teak. Didn’t See Something You Like? We understand that you have your own specific needs and tastes, so if our stunning teak memorial benches are not perfect for you, no problem! Simply let us know using the “product customisation” option for any alterations needed. 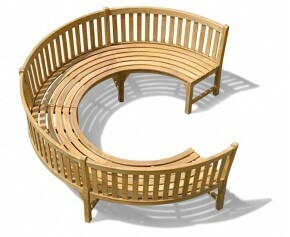 Whatever your requirements you can build your custom memorial bench with us. For beautifully designed, lifelong garden furniture, shop with Corido. 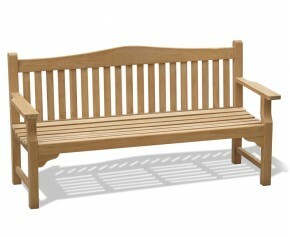 We also understand that specifying your perfect memorial bench can be a difficult and often drawn out process. What style of bench best represents your loved one’s taste, what message would they have loved most, where do you even put it once it arrives, what about thieves? All of these questions can linger in your mind, we can empathise. At Corido, we are happy to assist in any way we can to make sure you get the best and most fitting memorial bench possible. From engraved bench styles to personalised messages, our friendly team is on hand to help sculpt you and your loved one’s commemorative bench.